The Getty Linked Open Data services for their Thesaurus of Geographic Names (TGN), Arts and Architecture Thesaurus (AAT) and Union List of Artist Names (ULAN). WorldCat – Global library meta-catalogue. uBio – lookup a taxon name from uBio. CollectiveAccess – lookup a value from a different CA instance. 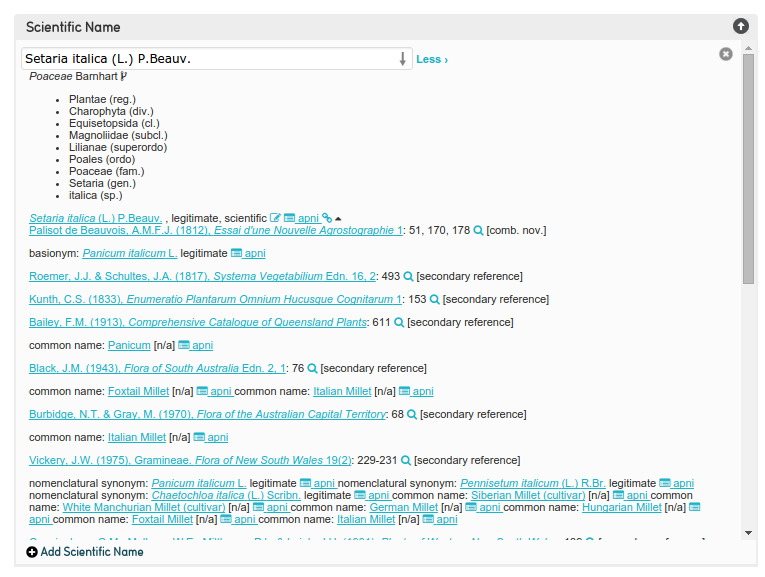 the Australian Faunal Directory (AFD). Under the auspices of the Atlas of Living Australia (ALA) there has been work to integrate the APC and the AFD into a single National Species List. I initially tried integrating with the web service referenced there, but I failed to implement a fast enough autocomplete using those services (and who wants to sit around waiting for an autocomplete?). 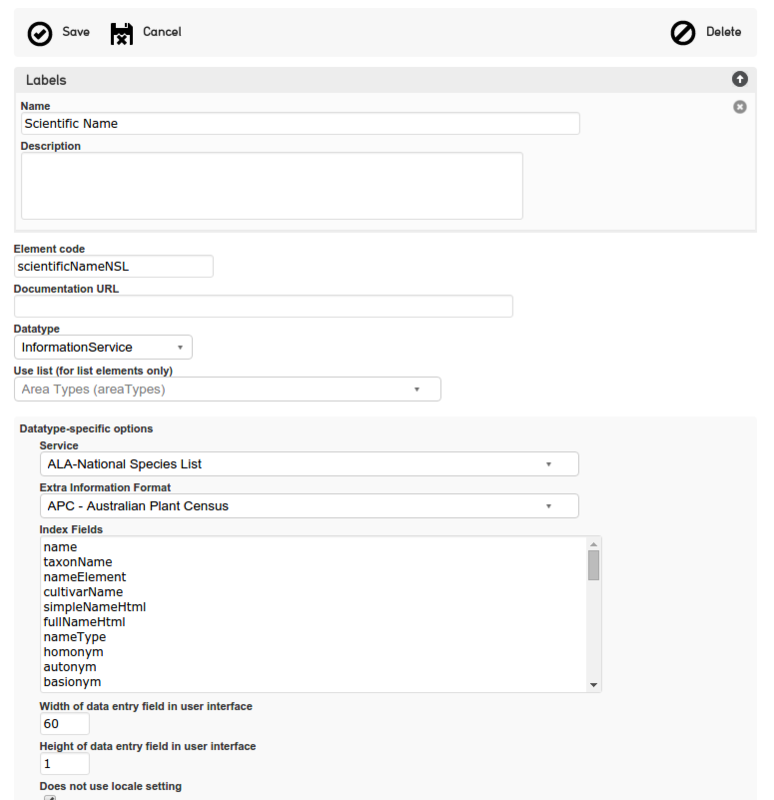 Then in my travels around the interwebs I discovered that the Australian National Species Lists (NSL) are currently evolving into a fully RESTful framework that has a good API that is well documented. Currently, only vascular plant names are included in this framework but I have it on good authority that fungi, algae, mosses, lichen and the AFD are on the way too (see the roadmap here). Configuring a field in CollectiveAccess to reference the NSL. You can choose which additional fields you want to add to the search index and also what format the information is presented in. 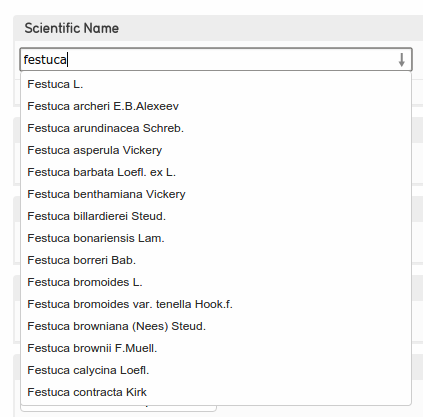 The autocomplete for scientific names. The NSL web service is responsive and provides just enough information so this autocomplete doesn’t leave the user frustrated. We have already contacted the developers of this new API to make some suggestions of possible enhancements especially relating to the embedded data format that they currently output. Doing this development is only one part of the cycle – CollectiveAccess is an Open Source project so now that we have implemented this locally we can give a little back. Thanks to Seth for accepting our pull request adding this new feature which will become available in the 1.6 version of CollectiveAccess. Now that we’ve seen how easy it is to reference external authoritative data sources within CollectiveAccess watch this space for further development. We’re also looking forward to having more data in the NSL and enhanced functionality in its API. Leave me a comment below, or start a conversation with us on Facebook, Twitter or LinkedIn.